This list of 446 references from murderpedia.org. 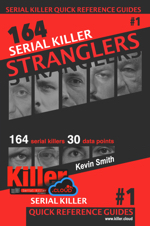 The references are used to document facts about serial killers on Killer.Cloud the Serial Killer Database. Patrick David MACKAY, Apr 11, 2019. Monte Ralph RISSELL, Mar 21, 2019. Cory Deonn MORRIS, Mar 21, 2019. Buddy Earl JUSTUS, Mar 21, 2019. Paul Eugene ROWLES, Mar 21, 2019. Bernard Eugene GILES, Mar 21, 2019. Cesar Francesco BARONE, Mar 21, 2019. Allan Joseph LEGERE, Mar 17, 2019. Melvin David REES Jr., Mar 17, 2019. Marc DUTROUX, Mar 17, 2019. Posteal LASKEY, Mar 17, 2019. Annie WALTERS, Mar 14, 2019. Amelia SACH, Mar 14, 2019. Larry RALSTON, Mar 10, 2019. Leonard John FRASER, Mar 8, 2019. Robin Stanislaw LIGUS, Mar 7, 2019. Trevor Joseph HARDY, Mar 7, 2019. Anthony John HARDY, Mar 3, 2019. Gregory John BRAZEL, Mar 1, 2019. Edward Joseph LEONSKI, Mar 1, 2019. Gabriel Arturo GARZA HOTH, Feb 26, 2019. Scott Wilson WILLIAMS, Feb 26, 2019. Jacobus Dirk HERTOGS, Feb 26, 2019. Stephen Peter MORIN, Feb 26, 2019. Bandali Michael DEBS, Feb 26, 2019. Craig Chandler PRICE, Feb 18, 2019. Colin Campbell NORRIS, Feb 18, 2019. Randall Brent WOODFIELD, Feb 18, 2019. Norbert Hans POEHLKE, Feb 18, 2019. Andras PANDY, Feb 18, 2019. William George HEIRENS, Feb 17, 2019. Daniel Owen CONAHAN Jr., Feb 17, 2019. Steven John GRIEVESON, Feb 16, 2019. John William COOPER, Feb 16, 2019. Peter MOORE, Feb 14, 2019. Léopold DION, Feb 8, 2019. Erno SOTO, Feb 8, 2019. Heinrich POMMERENCKE, Feb 8, 2019. Akira NISHIGUCHI, Feb 8, 2019. Robert Yale SHULMAN, Feb 8, 2019. Philip Carl JABLONSKI, Feb 8, 2019. Robert Earnest ROZIER, Feb 2, 2019. Colin IRELAND, Feb 2, 2019. Peter William SUTCLIFFE, Feb 2, 2019. Angus Robertson SINCLAIR, Feb 2, 2019. Kimberly Clark SAENZ, Feb 2, 2019. Bertha GIFFORD, Feb 2, 2019. Caroline GRILLS, Feb 2, 2019. Paul Steven HAIGH, Feb 2, 2019.